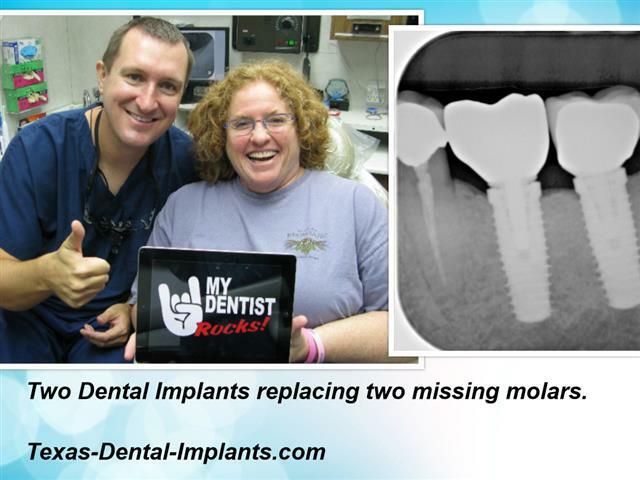 Pasadena, Texas Dentist Michael Nugent loves working with dental implants. Dr. Nugent knows that dental implants are the most advanced way to replace missing teeth. 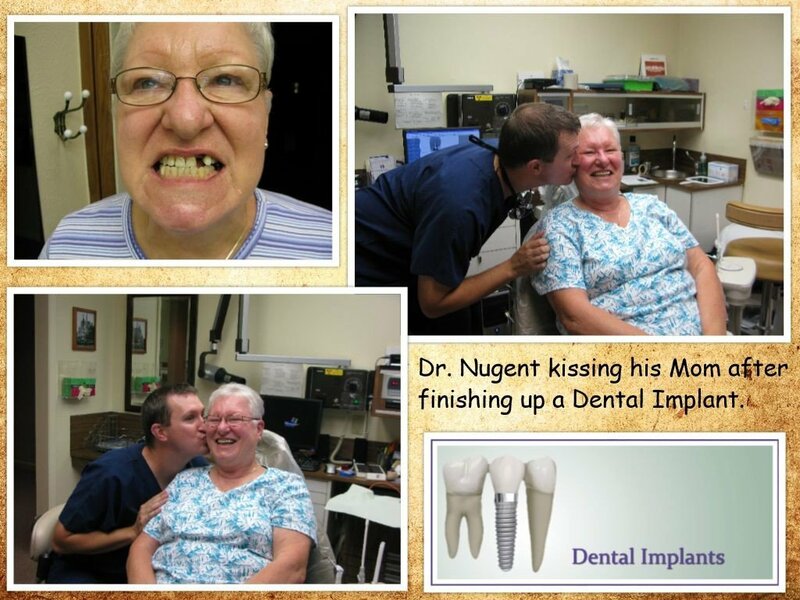 In fact, Dr. Nugent has completed dental implants on his father, father-in-law, and mother-in-law. 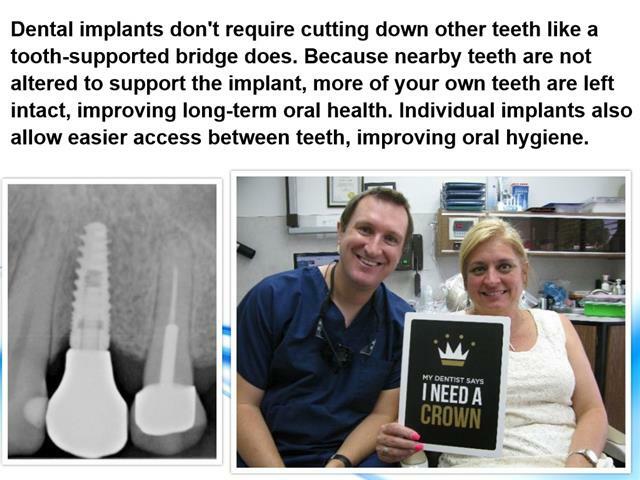 Also, Dr. Nugent has completed dental implants on two of his office team members and the daughter of a team member. Dental implants are the best way to replace missing teeth. 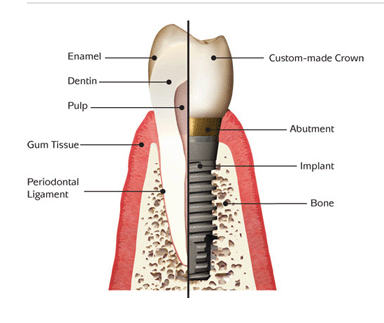 A dental implant is made of three parts, implant, abutment and crown. The implant is a titanium cylinder that is inserted into the jawbone. The bone loves titanium and will fuse with the implant in a process called “osteointegration”. The implant replicates a natural tooth root and will serve as an anchor for the restored implant. Next, the abutment screws into implant and will protrude out of the gum tissue. The abutment serves as the base for the cosmetic porcelain crown. 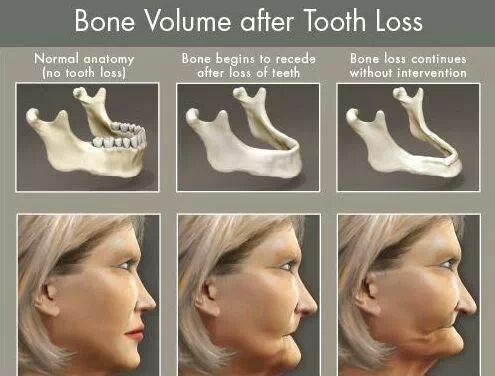 When teeth are lost there is an immediate loss of bone. The bone loss continues forever because the bone is not stimulated. Old fashioned teeth replacement options like bridges and partial dentures do not stimulate bone levels. Because the implant in anchored in the jaw bone, the dental implant will stimulate and preserve bone levels. This is a key point because with bone loss patients lose facial contours and a pre-mature elderly appearance ensues. Furthermore, when a tooth is lost the teeth will start to shift. A dental implant prevents the shifting of teeth. Patients from Pasadena, Deer Park, La Porte, League City, Friendswood, Webster, Clear Lake, Pearland and Houston Texas travel to see Dr. Michael Nugent. Dr. Nugent is a regional leader in dental implant therapy. Dr. Nugent is extremely passionate about dental implants and loves showing patients why dental implants are the best way to replace missing teeth. 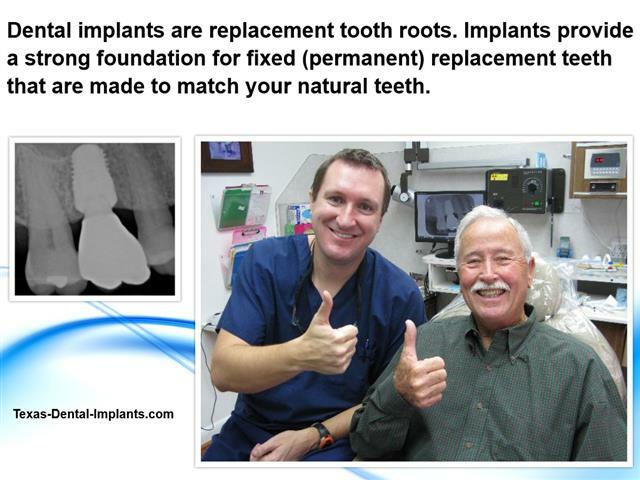 For further information, visit Dr. Nugent’s comprehensive Texas Dental Implant website. Discover why Pasadena Texas Dentist Dr. Nugent is a leader in dental implant therapy. Experience matters. Visit us at 3421 Burke Rd Ste A, Pasadena, Texas 77504.